Ghanshyam Das Birla was an entrepreneur par excellence who laid the foundations of one of the biggest industrial names in the country. From a meager corner shop, G.D. Birla ventured into industry with a jute mill. GM Birla Company rose to limelight when the demand for jute sacks increased following the onset of WWI. From jute he expanded into cotton and sugar mills. An unstoppable force following the industrial boom, Birla dabbled with newspaper publishing, automotive, silk manufacturing and even aluminum production. Birla's biography 'The Life and Times of GD Birla' provides rare insight into how the close knit Marwari community was responsible for the success of the business magnate. When his wife Maheshwari Devi died, he left his young children in the care of his joint family to look after business. When the kids were grown up enough to understand business they were sent off to fend for themselves by apprenticing under other merchants of the community. It not only provided them a livelihood, it made them aware of the ropes of the business and helped them accumulate a capital. The great businessman also was a strong-believer of giving back to the society as he made hefty donations to support the freedom struggle. Birla was also a close aide of Mahatma Gandhi and though the two had contrasting mentalities, it never came in the path of their bond. We bring to you some of the best quotes by the famous entrepreneur to inspire you when in self-doubt. 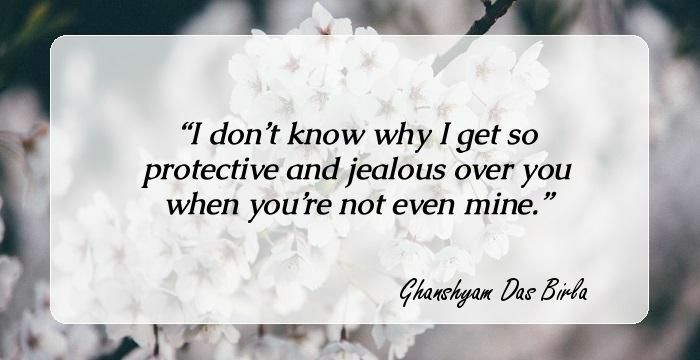 I don92t know why I get so protective and jealous over you when you92re not even mine. 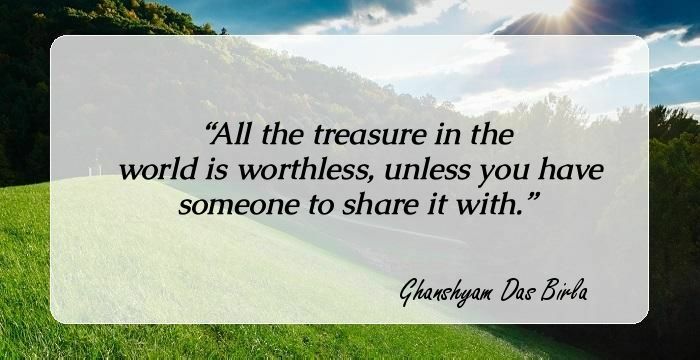 All the treasure in the world is worthless, unless you have someone to share it with. 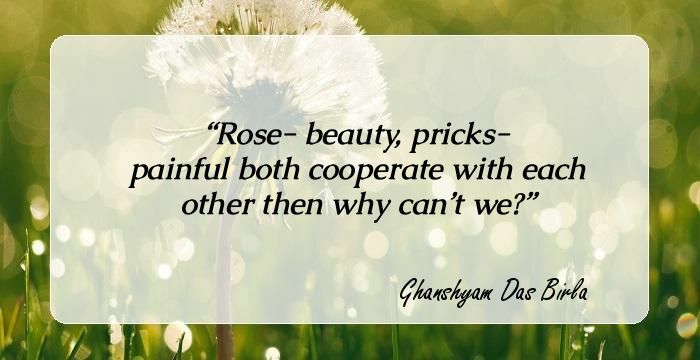 Rose- beauty, pricks- painful both cooperate with each other then why can92t we? I never belonged to you. I was never yours. We were never us. You confused a great friendship for something more than it was, and I92m sorry. Through every right and every wrong thing I92ve done, the wrong ones are the most fun doing. Don't play with someone's feelings just because you're unsure of your own. Our lack of compassion stems from our inability to see deeply into the nature of things. Sometimes you gotta accept the fact that certain things will never go back to how they use to be. Don't let someone who is no longer in your life continue to run your life.